Huckleberry’s Vineyard sits in the heart of the Green Valley of the Russian River Valley appellation. Known for its cool, foggy mornings and sunny, warm days, Green Valley offers a combination perfectly suited for growing Pinot noir grapes with bright fruit flavors and impeccably balanced acids. 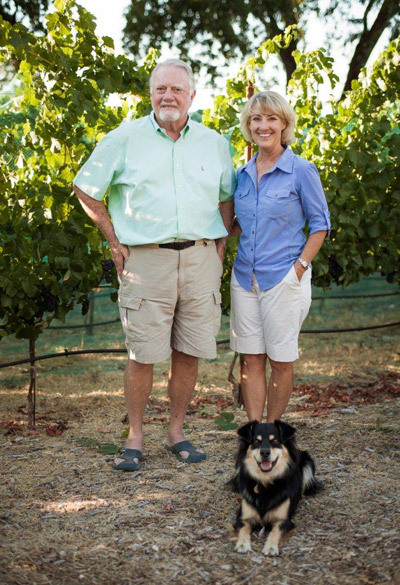 Bill and Lauren Hipp hand tend to this tiny sustainably farmed 1-acre vineyard with an attention to detail like few others. The vertical shoots are carefully positioned to let every cluster hang in on it’s own in dappled sunlight, slowly developing the robust berry flavors that this area is so well known for. Each winter, canes from the vineyard are composted and worked back into the soil providing rich nutrients for both the vines and the lush insectary flowers along the vineyard edge that attract beneficial insects and eliminate the need for pesticides. But most importantly, the vineyard host is Huckleberry, the very friendly dog, who greets all who visit with a great big smile. Talisman's debut vintage of 2008 Huckleberry's is a mere 22 cases - our smallest production ever!